This updated edition is almost twice as long as the original Fiver edition and has some really great information in it! You can order it here. The information on the back of the book follows. Scott Collins’ GuitArchitecture method replaces the standard approach to learning guitar (rote memorization) with a simple, intuitive two-string approach that anyone can learn. This method, where players can actually see scales on a fingerboard, is called sonic visualization, and it can be applied to any scale or modal system. 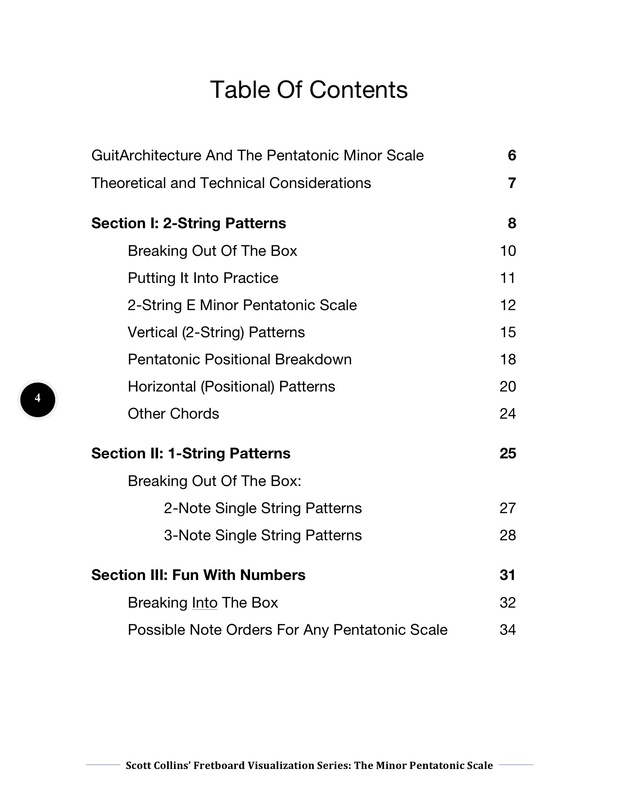 In this volume of his Fretboard Visualization series, Scott has used his two-string method to present the pentatonic minor scale in an easy, intuitive and musical manner. 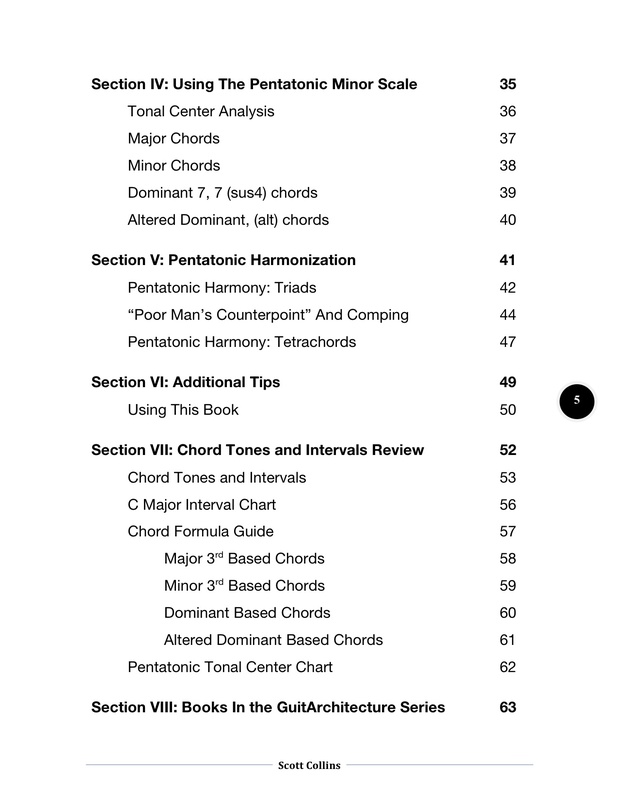 This book not only demonstrates how to “see” the scale all over the fingerboard, but also shows how to use the scale in a variety of contexts and presents strategies that can be applied to making any scale more musical. 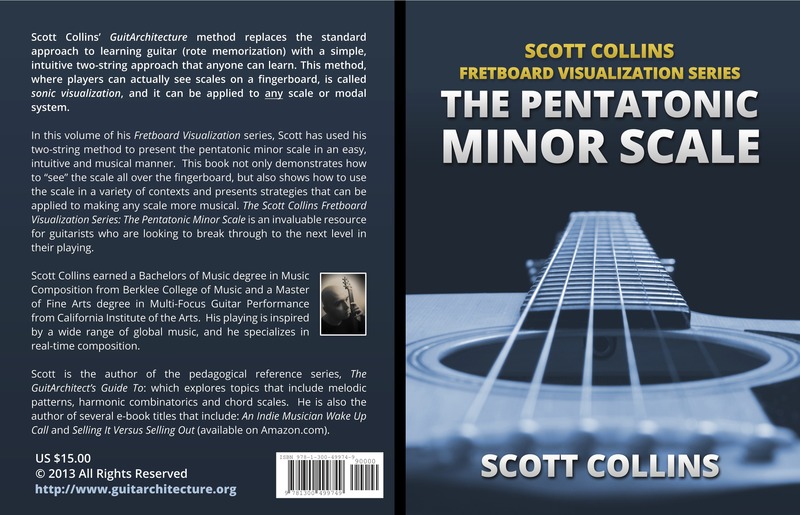 The Scott Collins Fretboard Visualization Series: The Pentatonic Minor Scale is an invaluable resource for guitarists who are looking to break through to the next level in their playing. In the meantime, for those of you on a budget – the original pdf lesson book is still available for $5 on Fiverr (That link is here). . In other words, it’s a series of short succinct lessons to get under your fingers to start playing but with enough meat on their bones to keep you busy for a while. The original pdf is available on Fiverr.